So to start off I know the first thing people will say is consult a good trainer. I also apologize that this will be a long post as well. Unfortunately today was our second meeting with a training company in Houston (1hr 45 min drive each way for us) who has outstanding reviews online but has really disappointed us. First meeting last weekend was a free meet and greet with an evaluation. I signed up for a 4 week basic obedience class after that and paid a premium price for it up front. The next week, which was today, we met up and it was a trainer we hadn’t met last week and who the owner hadn’t communicated well with. The trainer showed up 25 mins late for a 1 hour training session and about 15 mins before time was up they realized this was supposed to be a training session not another meet and greet. We have a 5 mo female Dutch from Cher car kennels in Michigan. She’s from the titan and scarlet litter if anyone is curious of her lines. As of right now she’ll sit, down, stand, stay, place, heel on leash, and wait at doors till she’s released. 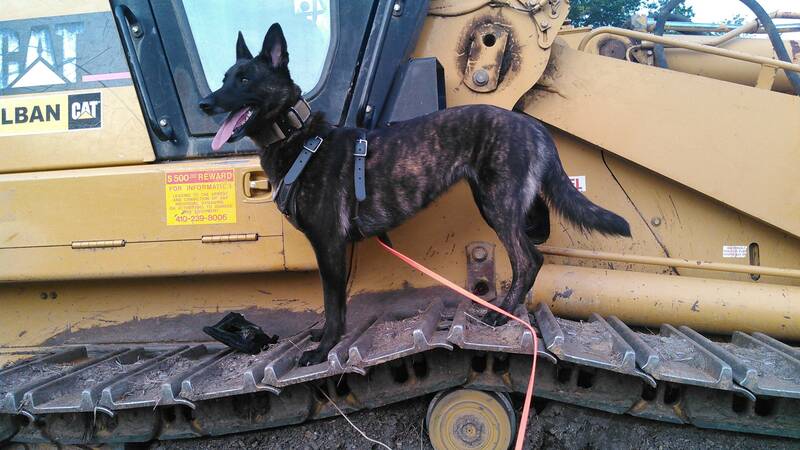 We are also working on tracking with her 2-3 times a week because that’s her favorite job. The only issue we see is she’s timid. If anyone but myself or my wife holds her leash she’ll resist. She doesn’t like being approached by strangers but if they ignore her she’ll ignore them. Also if they ignore her she’ll approach them but back away if they move too quickly. I was always the type that some dogs just aren’t people dogs, just like some people aren’t people people. I’m ok with her not loving everyone and running up to meet every stranger but her being frightened of being approached is my concern. The trainer we met with today told me I was wrong. That our dog should love everyone and said that we needed to build her confidence (I agree with the second part but not necessarily the first). But that the best way to do that would be a board and train so that our pup could work on gaining her own confidence and not getting her confidence from me. Currently we’ve been going to Lowe’s, Home Depot, academy, and multiple parks around the house every day working on getting her out and about and we work on our obedience everywhere we go. So long story short. Does anyone have any advice on building my pups confidence while we try and find a new trainer? I’m not the type to bash a trainer but I’m big on first impressions and if I’m paying a premium price for training I expect a premium service in return. We’re going to be asking for a refund from this trainer and on the look for another trainer ASAP. If anyone knows a good trainer in the Houston TX area willing to do weekly meetings please let us know. Also if anyone can recommend a great board and train trainer within 6 hours of Houston also let us know. I agree to find a different trainer! A board and train wouldnt be the best bet for your dog honestly! I'll look around and see who I know in that area! I'd honestly keep doing what you are doing as well! No not all dogs need to be friendly with everyone... but I would just continue to work her out in public and around people... i would let people pet her or handle her leash... my dogs could give a f**k less about most people... they arent fearful they just dont see people as value! And theres nothing wrong with that! Yea I would listen to what Steve suggested. Exposure in public will help. Take her to Home Depot and stuff like that. Dog friendly stores and walk around obviously not letting people pet her but expose her to people and distractions she’s not used to. If you need a trainer I’m not familiar with guys from Houston but I live in Austin and can suggest some people in the Hutto/round rock area. No, not all dogs need to love everyone. this is a protection breed, not a lovey dovey breed, that is what my Basset hound is for LOL. My Sadie does not like others and is not friendly. I dont force anything on her ( other than what she is supposed to do ) We go on walks and I have taken her out in public, but I do not encourage petting or for her to see other dogs. That is just not her. My other DS, did not care either way about anyone but me and my family, like Steve said, there was no value. Just do what you are doing but dont force people on her. Just take her out and always act like everything is fine. Dont make a fuss, tell people to not just go to her, make the humans wait until SHE is ready. I really appreciate all the feedback. We are still waiting for our refund from the first trainer so let’s keep our fingers crossed there lol. We have a vest for her that she wears in public with two large DO NOT PET patches in neon green and we still regularly have to stop people from approaching her and then get offended when we stop them. We go daily to either a walking park that is local, Home Depot, Lowe’s, academy, or one of two pet stores is during the week and on weekends we’ll usually do 2-3 different places daily. Well mix in obedience in all of our walks and outings as well. Making her sit while people walk by with buggies or a down stay when another dog walks by, place on random things we walk by, etc. When we pass people we don’t allow her to break heel either. We try and get her 100% focused on us and ignore any and everything else. If someone approaches us we’ll allow her to sniff them and as long as they don’t lunge for her she’ll lay down at my feet and roll her hip and set her head down and wait for us to finish talking. We did locate another trainer in Houston who appears to be experienced in working/ protection dogs and were set up for an evaluation this Friday. The new potential trainer is TYCALK9 if anyone has any experience with them. We’ll post up an update Friday night and let everyone know how her evaluation goes!! The work you're doing sounds great. Stick with it! Tycalk9 are very good at what they do! You'll be very happy with them! Tell us about yourself: This is my first Dutchie. 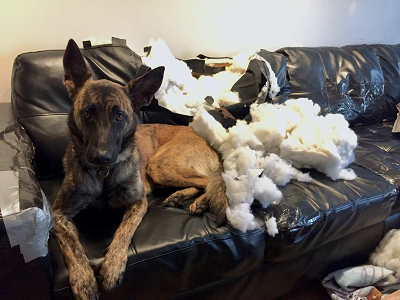 I’ve trained field trial labs and a Malinois in IPO. Lost my Mal to cancer at age 11 and wasn’t really looking for a pup yet. It just sort of happened and now I have a brindle Fur Missile living with me. His name is Jaguar; Jag for short.